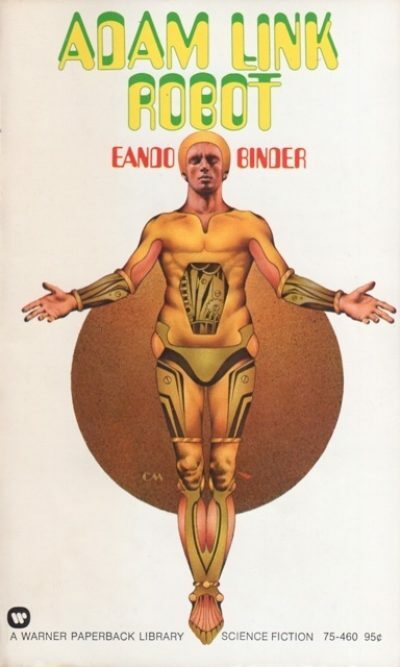 Eando Binder’s i 1965 Adam Link, Robot is a fix-up of stories first published in the late 1930s and early 1940s. Adam Link is the product of years of work by kindly Dr. Charles Link. 500 pounds of unstoppable metal guided by an iridium-sponge brain, the robot is the first of its kind. Thanks to Dr. Link’s careful training, it is not in any way a ravening, unstoppable killbot. Unfortunately for Adam, Dr. Link is one of the very few people willing to give the robot the benefit of the doubt. When Dr. Link is killed in a household mishap, Adam is immediately accused of killing the old man. With public opinion against him, Adam has little chance of winning a trial. Indeed, the odds of him surviving long enough to get a trial are poor. He is, after all, only a machine. Adam does have at least one human ally, Dr. Link’s nephew Thomas. The doctor was a scientist; Thomas is a lawyer, which just happens to be the sort of expert Adam requires. Even so, the Frankenstein myths have left a deep impression on the gullible masses. Any jury is almost certain to convict the machine. The standard procedure for a despised minority in Adam’s position is to prove his essential good-heartedness by saving one of his tormentors. Adam manages to save not one, not two, but three people from certain death! But nobody saw him save the first two, and he does not save an adorable moppet from being run down until after he is convicted. Happily, this is a narrative universe in which injustice is easily undone; after some formalities, the robot is set free. Which leaves Adam with a pressing question: what is the world’s first intelligent machine to do with himself? Fight gangsters, discover romantic love, resist efforts to entice him into the armed forces, and save the Earth itself! When I say “discover romantic love”, I mean “build himself a robot girlfriend named Eve whose mind is based on that of a human woman who is briefly infatuated with him.” As one does. I wonder to what extent these Eve stories influenced Roy Thomas, Stan Lee, and John Buscema when they came up with the android superhero the Vision? You may ask “why does a robot even need a girlfriend” and “how does gender work for robots, anyway?” The answer is Adam was a complete blank slate whose views were shaped by Dr. Link and the other humans with whom he spent a lot of time. He adopted male human behaviour as a result. Eve thinks of herself as a woman because her mind is a copy of a specific human woman’s ii. Unlike the majority of golden age scientists, Dr. Link seems to have kept decent notes. The main obstacle keeping Adam from building an army of robots is uncertainty about the purpose to which such robots would be put. Not to mention fear of how badly human-robot relations might evolve if the initial stages of robot introduction were to be mishandled. It’s a good thing for humanity that the humans who have the most effect on Adam are Dr. Link, Thomas, and Thomas’ secretary/love interest (once she accepts she cannot have the ineluctably manly Adam). Otherwise, humanity seems to be a dubious lot, always quick to accuse robots of crimes of which they are innocent, or to frame robots for [ditto], or to fall into a coma after [ditto], thus becoming unable to testify for their robot savior. Or they try to trick robots into joining the army. Or enslave them with mind-control devices. Adam was not built to be Three-Laws-compliant. It’s the influence of his creator, and his creator’s associates, that turns Adam into a gentle, humane robot. Every time a human treats him badly, they risk discovering the limit of how far Adam can be pushed. The first Adam Link story, “I, Robot,” predates Asimov’s first robot story “Robbie”, by twenty-one months. This did not prevent Gnome Press from appropriating Binder’s title for their 1950 collection of Asimov robot stories, a decision with which Asimov was not happy. While the Asimov stories of helpful, obedient robots are far more famous, the Binder brothers got there first. This raises the question of why it is that Adam Link isn’t better known. The answer is “because aside from the idea of having the robot be sympathetic, the first Adam Link story wasn’t that remarkable and each successive story is a bit less impressive.” The Binders do at least escalate the stakes in each story but the prose is pedestrian and Adam’s enemies — gangsters, crooked politicians, and finally aliens from Sirius — are increasingly unconvincing. It’s a pity, because there’s untapped potential in the character. Adam Link, Robot is available here (Amazon) and here (Chapters-Indigo). iEando Binder was the pen named used by siblings Earl Andrew Binder and Otto Binder. iiIt’s interesting that no one sees copying human minds into nigh-indestructible bodies as being a sort of immortality by proxy. Great accurate review, I first read this book in 1974. I loved it, it might be a bit dated like a old 1940's saturday morning serial. But a great book all the same. I wish someone would do a big budget updated version. As either a few movies or as a 12 part series for tv. This edition with the 70's style cover really grabbed my attention as a young teen of 12 or 13 then. I was even lucky enough to get a signed by the author Eando Binder mint copy of the 1965 edition. For like $13 off eBay in 2010. DC Comics Metal Men & Marvel's Jack Kirby's Machine Man. I believe borrow a lot from this novel.